Hey there music fans. Can you believe it is the end of 2016? Every music site publishes a list at the end of the year that showcases their opinion on the best songs of the year. Here is my version. Sound off in the comments section at the end of the post and show your version. At the end of the day, let’s just enjoy the music and spread the music. Thanks for viewing. 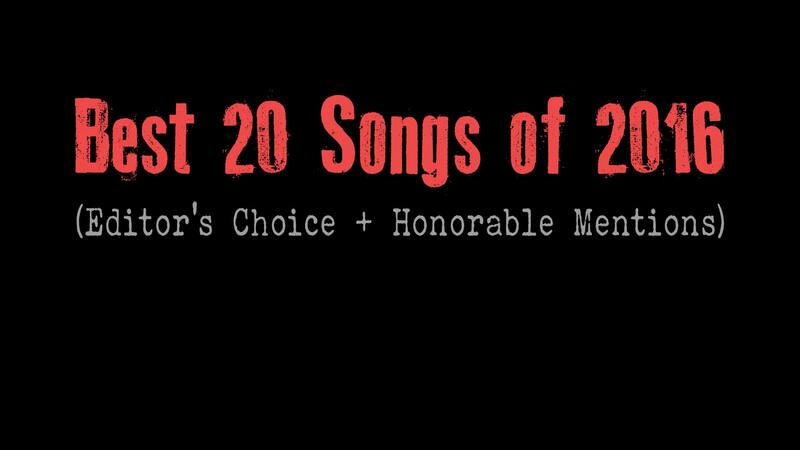 Listen to this Top 20 list as a Spotify playlist here or Youtube video playlist here. Twenty One Pilots have had a remarkable last couple years! Last year their hit “Stressed Out” ruled pop and alternative charts for much of 2015 and was followed by a strong second single in “Ride”. On the coattails of their 2015 success came their 2016 single “Heathens” from the Suicide Squad soundtrack . I reckon this is a top 5 song in the vast majority of 2016 year-end lists. It’s the clear #1 song of the year here on Music Trajectory. Sting, my old chap! What a hell of a song you came up with. You resurrected your rock sound from your Police era and had a killer 2016 because of it. In my opinion, this song ranks right up there with the best of your career, solo or otherwise. Love it, love it, love it! Much like Twenty One Pilots, The Weeknd had huge crossover success in 2016. Dual hits “Starboy” and “False Alarm” are played on both alternative and pop stations alike. You can’t get much better than that. I’m personally a bit more partial to “False Alarm” but “Starboy” is the better song and a clear mega-hit of 2016. The rest of the album might not have been very good but “Ophelia” got The Lumineers back in business. One of the best tracks of 2016 indeed. When will Anthony Kiedis stop looking good with his shirt off? The dude is 54! Keep up the good work on that front and keep writing songs that kill it on the alternative music charts. The Chili Peppers are alternative music legends. Good for you Mark Hoppus. You shed the dead weight *coughTomcough* and resurrected a band that is insanely popular. Good choice with Matt Skiba. A fine fellow who has a strong track record and a great voice for this type of music. California was a sick album. Cage the Elephant churns out hit after hit after hit. The majority of singles off of Tell Me I’m Pretty came out in 2015 but “Trouble” kept them going strong in 2016. Deemed best song in the world back in September. Do you know anyone who didn’t like this song? Who doesn’t like Fitz and the Tantrums for that matter? Catchy songs that make you (at least) want to get up and dance. Billy Joe got healthy and back to business in 2016. The album didn’t fair too well but lead singles “Bang Bang” and “Revolution Radio” rank right up there with the best in Green Day’s discography. WALLS was one of the most highly anticipated albums of 2016. To me, it was one of the worst albums I heard in 2016. Ironically, “Waste A Moment” is one of the best songs by KoL…ever (in my opinion). Give this song about 3 listens and you will be HOOKED. Hell yes. Metallica returned in 2016 after (way too many) years since their last album release. We can talk all day long about the album and if it’s good or not but the statement that I want to make is this: “Moth Into Flame” is the best Metallica single since any singles off of Black Album. That’s right, better than anything off Load, Reload, (surely) St. Anger, and Death Magnetic. Well done boys. This might be the first time you’ve heard this song. I called it an Editor’s Choice list, didn’t I? Just be happy with the fact that I brought this song to your attention, because it’s awesome! Great song, great album, great band. If you haven’t listened to the rest of the album, do yourself the favor. It’s one of the best of albums of the year. “Good Grief” was the lead single. This song was released way back in August of 2015 but it eventually caught on in a big way and won over the hearts of everyone who loves indie-folk and more! We miss you Zack but we are happy to see Tom Morello back at it with Tim and Brad and now members of Public Enemy and B-Real from Cypress Hill. This is actually a Public Enemy song from back in the day but reworked in the RATM style. Will we see an all-originals album from these guys in 2017? This one is a grower. Give it a chance. Great song! If you like indie pop, you should love this one. A great comeback album from Primal Scream. Check out the classic album Screamadelica . You’re new favorite song. You’re welcome. If you are a fan of the site, you know it is mostly a showcasing of alternative music. Pop music doesn’t see much light of day on the site. But some pop songs got some love and landed in the following honorable mentions list.